← Fava bean and zucchini fritters! 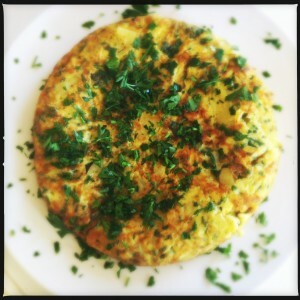 Late lunch tortilla – with some green in it this time! You all know I love making a good tortilla española. Well I got the urge again and decided to throw one together for a late lunch on my off-Friday. Yes, a day for me to catch up, do what I want, and soak in little indulgences like this! I had just been out in the back yard and noticed the parsley overflowing (finally – I can never grow that stuff!!). That in conjunction with a certain chef friend always bugging me that the spanish food I cooked didn’t have enough color in it, I decided to make “Tortilla con ajo y perejil” or Spanish tortilla with garlic and parsley. What did that chef know about tortilla and traditional Spanish food and color, but I decided to indulge her anyway. It didn’t hurt either that this recipe came from my favorite Spanish cook book, ¡Delicoso! by Penelope Casas. This recipe is the same as the traditional Tortilla Española recipe I’ve posted and gone on and on and on about on here and facebook. Sue me – it is the most basic and wonderful thing to eat as far as I’m concerned! The only difference with this recipe is that you add two teaspoons of chopped parsley and one minced garlic clove into the egg before mixing the cooked potato. It cooks up exactly the same. I couldn’t wait to take a bite out of this one. I will admit the parsley does give an extra flair of color, and along with the garlic a whole new flavor profile. I like it! But I think I’m still a traditionalist and like it just with egg, potato, and onion the most. 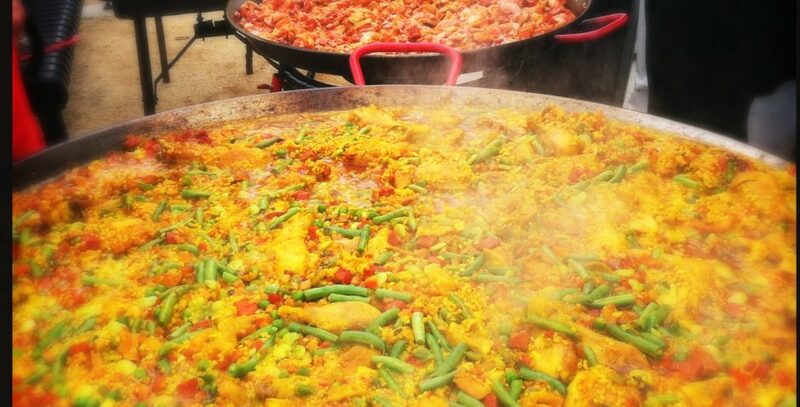 Perhaps next gathering where I serve Spanish food, I will serve both and let me guests be the judge. ¡Disfruta! I could hardly wait for it to cool, but it’s better when it sets for a bit or even the next day out of the fridge! 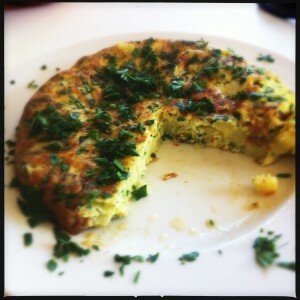 One Response to Late lunch tortilla – with some green in it this time!